Also known as a stainless steel crown (SSC), is an extremely durable restoration with several clear-cut indications for use in primary teeth (baby teeth) including: following a pulpotomy/pulpectomy; for teeth with developmental defects or large carious lesions involving multiple surfaces where an amalgam is likely to fail; and for fractured teeth. In other situations, its use is less clear cut, and carries risk factors, restoration longevity and cost effectiveness are considerations in decisions to use the SSC. SSC is recommended for children with extensive decay, large lesions or multiple surface lesions in primary molars. 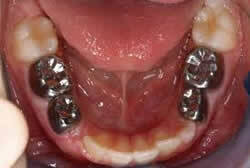 Protect the teeth of a child at high risk for tooth decay. Decrease the frequency of recurring decay for children due to their age, behavior, or medical history to fully cooperate with the requirements of proper dental care. After a pulpotomy/pulpectomy has been performed. 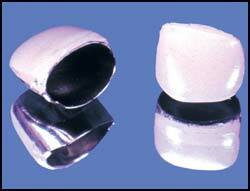 Also known as a Kinder Crown, is essentially a stainless steel crown with a tooth colored resin overlay. Primarily used for the front teeth for aesthetic purposes, while maintaining all the benefits that a stainless steel crown offers. These are typically the least expensive option when it comes to selecting a dental crown material, but they come with the disadvantage that resin can wear down more quickly than other material types. Resin dental crowns look good in your mouth, but may need to be replaced more quickly than other types.